Are you looking to grow your business and attract more customers using local SEO strategies? Local SEO is an effective way to market your business online because it helps businesses promote their products and services to local customers. One of the best local SEO strategy to help improve your online visibility is Google My Business. Google My Business is a free and easy to use tool for businesses to manage their online presence. Claiming and verifying your local business’ Google My Business listing can increase your chances of showing up in Google’s Search, Maps, Local Pack, and Local Finder. Below is how your business would show up on Google’s search results. 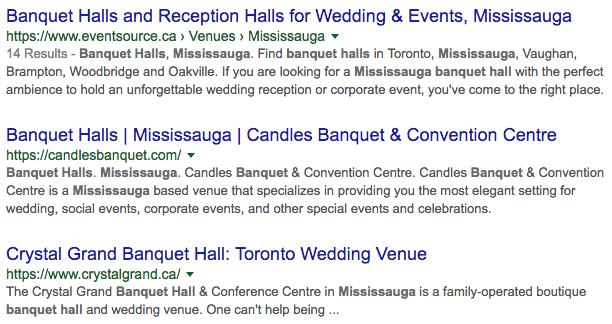 If you Google search the term “Banquet Hall Mississauga” you will see the top 3 businesses on the first page. Related Article: Why is SEO Important for Small Businesses? Google My Business will help you manage the information that customers see when they search for your business, products, or services. Did you know that businesses who verify their information with Google My Businesses are twice as likely to be considered reputable by potential customers? You’ll be able to read and responds to reviews from your customers and post photos that show off what you do with Google My Business. Did you know that businesses that add photos to their listings receive 42% more request for driving directions and 35% more clicks through to their websites than businesses who don’t? You can see insights on how customers search for your business, as well as where those customers are coming from. You’ll be able to see information such as how many people called your business directly from the phone number displayed on local search results. If you haven’t claimed and verified your Google My Business listing, that’s the first step so visit https:www.google.com/business to get started. There are many local businesses that just claim their Google My Business listing and forget about it. Most local businesses don’t realize that Google offers a variety of other features that you can use to optimize your Google My Business listing. Google will ask you to fill out information about your business such as address, hours, and phone in order to complete your Google My Business listing. This information will make it easier for your potential customers to find more information about your company. Completing all the information Google asks for is very, very important because if you don’t, anyone including your competitors can suggest a change or edit to your business listing. 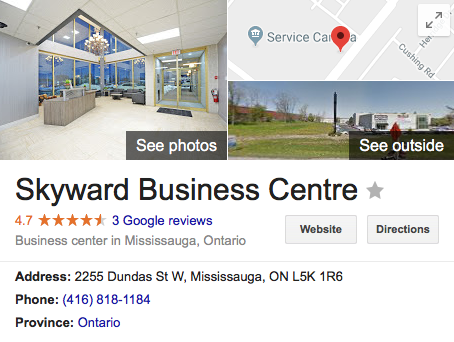 Take a look at this example of Skyward Business Centre, an office space in Mississauga. This is how your Google My Business listing will look like with all of the information filled out. Your Google My Business listing is just like your traditional website SEO. Google uses a variety of factors to serve search results, therefore including important keywords to your business will be helpful since your website is listed directly with your Google My Business Listing. For example, if you’re selling a product like ATVs you should include keywords such as ATVs for sale, quads for sale, and four wheelers for sale or if you’re providing a service such as installing charging stations for electric cars, you should include keywords such as electric car charger, home charging station, and condominium charging station. 1. If you’re having an event you can set up an event Post with a date and time. 2. If you have a sale going on during a specific time you can create a sale event Post. 3. If you created a killer blog with amazing content, add a short description and link to the post on your blog. Google has a booking button feature that can help your business stand out from the crowd. If your business relies on customers making appointments and you’re using an integrated scheduling software, people can now book an appointment with your business directly from your Google My Business listing. Questions & Answers is an amazing feature for Google local search. This allows people to ask questions about your business and you’ll be able to answer those questions. Did you know 85% of consumers trust online reviews as much as personal recommendations? Google encourages businesses to ask their customers for online reviews. These reviews will appear next to your listing in Google Search and Maps which will help your business stand out in search results. Make sure you add photos and videos to grab people’s attention. This is a great way to show off your brand and let your customers find out what your business is all about. Google now allows businesses to include a business description on their Google My Business Listing. This gives you the chance to tell potential customers your story and what makes your business unique. Please keep in mind that you only have 750 characters and only 250 of those show up in the Knowledge Panel. The services and menus feature is useful if you sell services such as a spa, nail salon, or hair salon. This feature allows you to list out all of your services and provide prices so that potential customers can easily see what your business has to offer.This feature is only available for health, beauty, food and drink, and other service businesses that don’t have a third party menu link. The Retailors Group also offers other services such as Experiential Marketing, On-Site Sales Assist, and Retail Management.